Please Join us for the installation of the 2018 National Board of Directors! We will also be recognizing exceptional leaders and outstanding volunteers. Keynote Speaker: Holly Ham, Executive Director of the White House Initiative on Asian Americans and Pacific Islanders, housed in the U.S. Department of Education in Washington, DC. The White House initiative aims to increase access to and participation in federal programs in which Asian Americans and Pacific Islanders are underserved. Special Remarks Speaker: Matthew W. Sibley, Rear Admiral U.S. Coast Guard, acting Director of Reserve and Military Personnel, Rear Admiral Sibley is responsible for the development and oversight of military personnel policy programs to recruit, manage, shape and support approximately 7,000 Coast Guard Reserve component members and more than 40,000 Active Duty members. Installation of FAPAC Officers: Antonio Mario Taguba, a retired major general in the United States Army. He was the second American citizen of Philippine birth to be promoted to general officer rank in the Army. Taguba is best known for authorizing the Taguba Report, an internal U.S. Army report on the abuse of detainees held at Abu Ghraib prison in Iraq. The report was leaked, then published, in 2004. 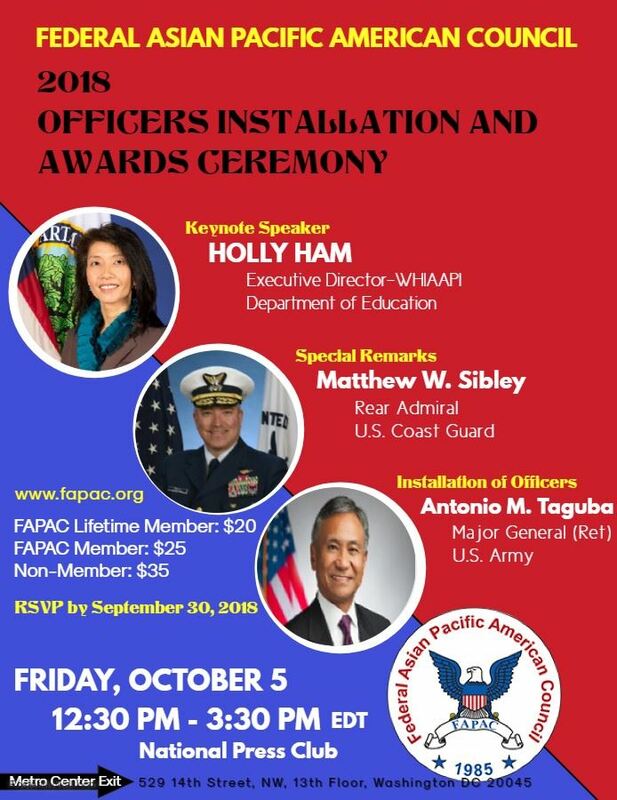 FAPAC is a 501 (c)(3) nonpartisan, nonprofit organization representing the civilian and military Asian Pacific American (APA) employees in the Federal and District of Columbia governments.